The dissertation has been pretty overwhelming lately. This is the big push before the defense so I haven’t had much time for all the things that I love like spending time with my friends, cooking, blogging, eating out and drinking. I miss the drinking. I ran an errand the other day and saw some nice people drinking wine in the shade. I remember jealousy thinking, “I bet they don’t even appreciate that wine!” Suddenly, I was overcome with the desire to grab their glasses out of their hot little hands and go sprinting down the street. I didn’t do it, but I sure wanted to. No way did I think that I was going to be able to participate in the Daring Kitchen challenge this month either until I saw the challenge: cooking en papillote. En papillote is a fancy schmancy way of saying that you cook something in a paper envelope. We’re not talking about any old paper here; we’re talking about parchment paper, also known as bakery release paper or greaseproof paper. Cooking in parchment is a terrific way to cook delicate things quickly without fear of them drying out. You can also roast food en papillote as the paper allows just enough steam to release so that potato skin, for example, gets nice and crispy while the insides gently steam to perfection. You could use aluminum foil instead of parchment paper — also known as a hobo pack — but I find that the results lack the finesse and elegance of cooking in paper. I might also be too negatively affected by the word “hobo,” and too seduced by the phrase “en papillote“! It’s true that this month’s Daring Kitchen assignment wasn’t really a challenge for me since cooking en papillote is one of my favorite cooking methods. On this blog, I have posted a recipe for roasted tiny potatoes en papillote and roasted salmon with mango and Bird’s Eye chiles. However, it was completely new for me to use this cooking method to make a something sweet instead of something savory. This dessert recipe was inspired by one that I saw months ago on Elle à table, the companion cooking site of French Elle Magazine. I kept the primary components — parchment, peaches and raspberries — and changed the rest. The original recipe has you peel the peaches. However, if the peaches are nice and ripe, this step seems fussy. It also seems like it would be a big waste of precious juice. The Elle à table recipe also calls for lime zest and juice, whereas I only used the zest for fear that the extra juice would have made the dessert too watery. Instead of a lime, I used a lemon. I also swapped out the cinnamon for vanilla bean, and shortened the cooking time so that the fruit would stay more intact. Just like there is more than one way to roast a chicken, there is more than one way to make a parchment paper packet. Traditionally, you take a large piece of parchment paper, fold it in half, and cut out a heart — just like how you did as a child. After you position your food on the paper, you seal up the packet by folding or crimping the edges shut. To give you an example of how to seal up a parchment paper packet, here is a video with Chef Paul Prudhomme — who can pronounce papillote any dang ol’ way he pleases in Cajun country. Alternatively, you can arrange your food in the center of a square of parchment paper, pull two of the sides up, fold them down, and then tie off the ends with cooking string. For some more examples of parchment paper packets, I direct you to this month’s Daring Cooks’ Challenge PDF. In the end, it doesn’t really matter how you seal up the parchment paper as long as you make sure that your packets are snug, but not too tight around your food. I made two different kinds of packets for this challenge. You can see them both in the photo gallery below. This challenge didn’t take up too much of my time since I had the fruit already (it’s high peach season here). Most importantly, it reminded me of how valuable it is to not give up those things in life that give you pleasure at those moments in life when you feel most stressed out. A big thank you to Sarah from All Our Fingers in the Pie for the terrific challenge 🙂 In terms of mandatory items, you only asked that we cook in parchment. As suggestions, you gave us some amazing savory ones like beef, lamb or rabbit. I chose a gourmand take on cooking en papillote, which I hope still keeps with the spirit of the challenge even though it might not have been as challenging! Mandatory blog checking lines: Our July 2012 Daring Cooks’ host was Sarah from All Our Fingers in the Pie! Sarah challenges us to learn a new cooking technique called “Cooking En Papillote” which is French and translates to “cooking in parchment”. * The reveal date for this month’s French cooking challenge happens to fall on Bastille Day: le 14 juillet 🙂 Bonne fête, tout le monde! 1. Pre-heat your oven to 400° F.
2. Defuzz the peaches by very gently rubbing as much of the peach fuzz off as you can under cold running water. Cut the peaches into slices that are a little more than a quarter-inch thick. 4. Crimp or tie off your parchment paper parcels and arrange them on a large baking sheet. Bake them between 8-10 minutes. Remove them from the oven and carefully open them (they will be steamy). Find and discard the vanilla bean pods. 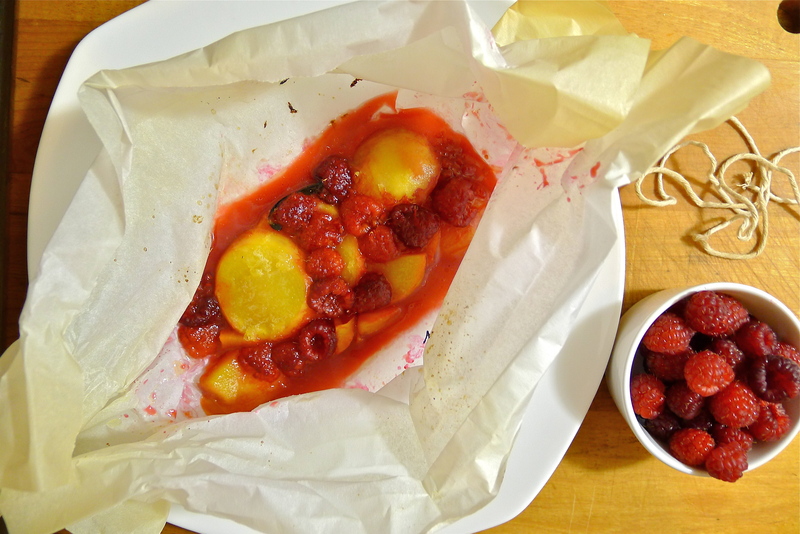 You can serve the peaches and raspberries straight from the paper, or you can transfer the fruit to a small bowl to top with a scoop of vanilla ice cream or gelato. * Although punnet is a Britishism, but it’s a pretty useful word for those little plastic or molded paper baskets intended for berries. We don’t seem to have any equivalent in American English (the closest approximation is a pint basket). Furthermore, punnets for raspberries are generally smaller than the containers used for pints of strawberries . . .
Merci! Oui, c’était très bon! Et très simple à faire 🙂 La meilleure combinaison! Thank you! It is super simple. I would put the difficulty level and very easy. It is a super simple way to make something that looks like you slaved in the kitchen all day. For cooking en papillote, I think that the only things to keep in mind are that whatever you are cooking should cook quickly (fish is ideal), vegetables should all be cut to the same size so they cook the same, and that some herbs don’t really stand up to steaming (like basil). Thanks for the Bastille Day wishes and the defense day support! You are the best 🙂 It means so much! I’d never heard of a punnet before. What a great word. Une barquette en français? Lovely fruit! Why don’t we have something similar? Other than that plastic-thingy-you-put-like-raspberries-and-blueberries-in? I wish this would take 3 nights! It’s my doctoral dissertation, so we’re talking 200+ pages. I am glad that it is not on a typewriter though. Could you imagine! Nightmare! Thank you for the encouragement! It think mine is on the low side in terms of pages. I have some overly verbose colleagues who clock in 400+ pages. THAT is insane. Wow. You were right! It was in the spam folder. That is so weird! It hasn’t happened to me yet, but undoubtedly it will at some point. That tab on the right hand side is infuriating. Sometimes it will delete my replies while I am writing them. Thank you! A good friend of mine told me that the best day of his life was when he took all his dissertation notes in the dumpster. I don’t think I’ll do that, but I bet that once I return all these library books, my apartment will be HUGE! I’ve missed you too, Frugal! Soon, I will be back to my old blogging self. I can’t wait! A couple of weeks ago, I went to a friend’s going-away party. She was moving to London and I didn’t think I could miss it. I think I drank 3 bourbons straight in about 10 minutes without realizing it. It was like I was let out of prison! Studying is great. I do have to say though that when you are near the end, you just don’t even want anything to do with school anymore! But you have a long way to go till then. When does the term begin for you? October, right? Haha! I look forward to your return proper :D. Blimey… that sounds fun :D. Yes, October it should start providing the funding gets there. I can’t wait! Thinking of you and that dissertation – oh the joy when it is done and you can marinate yourself in good wine! And you’re a bourbon drinker? *snap* Yay team!!! Man are we gonna have fun when I hit NYC. This recipe looks sublime, but no good for us wintering out the season Down Under. I’m going to try a take on this with apples and strawberries and let you know how I go! Thank you! I can’t wait till this is over. We’ll have such a wonderful time! There is a place downtown called the Brandy Library. They have great stuff that you will never see outside of the US. We’ll go for sure! Apples and strawberries en papillote? That sounds so yummy 🙂 Let me know how it goes! Haha, that cracks me up! Your peaches and raspberries look delicious, great job! And good luck on your dissertation! And have a nice glass of wine when it is all done! This challenge was the first time I had ever cooked in parchment and it definitely won’t be the last. I love this fruit recipe as well as the other two that you linked to in your blog. What a great way to roast tiny potatoes! I’ll be trying the fruit recipe soon! Welcome to the Daring Cooks, Jenni! Your chicken looks like it turned out marvelously as well 🙂 I love that you used mushrooms in yours as they seem to hold up so well steamed! The roasted potatoes recipe is awesome. I was lucky to find these adorable little potatoes about the size of a quarter at the Farmers Market, but it works well with larger potatoes cut into smaller pieces too. Thanks for the message. The Daring Kitchen is such a great way to meet other food bloggers! You, on the other hand, are clearly working too hard, so here’s to a happy ending to this epic! Nothing wrong with being a lazy show-off! Thanks for the encouragement too. Looking forward to the end! Oh these look soooo good. Wouldn’t have minded some of these yesterday for Bastille Day! Thanks! They were easy to make and tasted like summer! If you do, definitely let me know how it turns out! There is so much delicious stone fruit at the market right now. I bet plums or pluots en papillote would be awesome. How did you know my a/c just broke? 🙂 A shortened oven time would be extremely appreciated!! Sorry about your a/c! Go to the movies! This is SO pretty. I adore the photo how-to with the cut out heart. Awwwwww! And that is so funny about the muggings. How did you know I would go for the Chablis?! Oh, please sign me up as a future reader for your dissertation turned into a book–the topic sounds fascinating. I wish you lots of luck! The combination of raspberries and peaches is one of my favorites. I have a recipe for a jam that uses similar ingredients. I also like to add a tiny bit of rosewater to highlight the floral notes in raspberries. Will have to try your recipe in a compote form, since I have no oven yet. Thanks! It would be great to turn it into a book at some point. Otherwise, it seems like my audience is 5 . . . 5 poor faculty members roped into reading it! In any case, thanks for the words of encouragement! As well as for the suggestion of the rosewater! That is brilliant. I would never have thought of that, but now it sounds absolutely perfect! When I lived in France, I didn’t have an oven-oven, but I had one of these combi-ovens that I could fit a chicken in. Surprisingly, it worked really well! Looks so good! And so good also to time-out with what you enjoy. Yum. yes! the kind of trains that whistle romantically. Oh yum! I want to try this one! Aw, thanks! It’s super easy! I can’t wait to get back into the kitchen. What if I have forgotten how to cook?! The vanilla bean baked with the fruit must have given it such wonderful flavor. The aroma in the kitchen must have been lovely. Thanks for the comment! I hadn’t either, and was happy with how well it turned out. Now that the weather is turning, I’m thinking about apples and pears en papillote. Doesn’t that sounds good? Lots of possibilities this fall! I know! Love this season and getting back into full cooking without melting. Very true 🙂 Here’s to no more kitchen saunas for a few months!